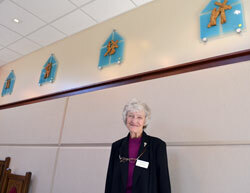 Franciscan Sister Norma Rocklage stands near four of the Stations of the Cross that were dedicated in her honor for the chapel at Cardinal Ritter Jr./Sr. High School in Indianapolis. (Submitted photo) Click for a larger version. The tribute initially stunned her. Then, the more she thought about it, the choice of how she was being honored touched her. She sees the tribute as a loving recognition of the way she has lived her life for the past 60 years, the people she has shared that life with and the saint who has inspired her. So there is a blend of joy and humility in the voice of Franciscan Sister Norma Rocklage as she recalls her recent meeting with a couple who donated a new set of Stations of the Cross for the chapel at Cardinal Ritter Jr./Sr. High School in Indianapolis. The donors, who have asked to remain anonymous, viewed the dedication as a fitting honor for the 78-year-old religious sister who continues to be active and vibrant in a vocation that began more than 60 years ago in September of 1951. She is executive director of education formation outreach at Marian University in Indianapolis. For the past 22 years, she has also been director of the college’s Indiana Catholic Principals Institute, which trains principals to maintain and grow their school’s Catholic identity while also developing the spirituality and faith formation of their school’s students and teachers. Even while they asked to remain anonymous, the donors felt compelled to write a tribute to Sister Norma, a tribute they shared with administrators of Cardinal Ritter High School. “The Stations of the Cross depict the immense love that God has for his people,” the donors wrote. “It is fitting that the new Stations of the Cross are dedicated in gratitude for the ministry of Sister Norma because she is known for her self-giving love and her total dedication to serving God by caring for others. Sister Norma kept that spirit of humility when the new Stations were dedicated during a Mass at the high school chapel on April 2, the Monday of Holy Week. She also thought of St. Francis of Assisi and his devotion to the Stations of the Cross and Christ’s Passion. She mentioned some of the prayers that St. Francis wrote, prayers that are often used when people reflect upon the Stations of the Cross.